CHEYENNE, Wyo. — It was a long time coming for two U.S. Air Force veterans. But when it finally happened, the moment was worth the wait of a lifetime. Cheyenne resident Ray Cahoon and Roy Salmon of Melbourne, Florida, met while stationed at Tachikawa Airfield in western Tokyo in 1957. Two years later, however, they lost touch after Cahoon was transferred while Salmon was at a track meet in the United States. 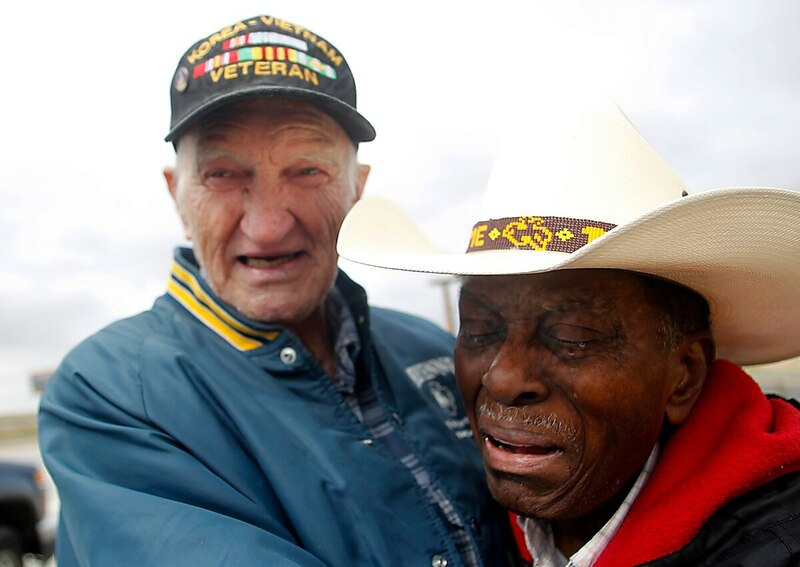 For decades, the two men didn’t speak, but they never forgot one another. That was until summer 2017, when Salmon went out on a limb and reached out to the Wyoming Tribune Eagle asking if its managing editor could find his old friend, who he knew once lived in Cheyenne. Though he tried to find him before through the Air Force, Salmon was unable to do so. Undergoing treatment for prostate cancer, the 82-year-old Salmon knew it might be his last chance to find Cahoon. A short time after he sent his letter to the newspaper, Salmon received a letter from Cahoon, 84, confirming he was alive and well. Since then, the two have been exchanging letters and phone calls catching up after decades apart. Last Friday, the two shared a moment transcending letter and phone correspondence when they met at the Wyoming-Colorado border on Interstate 25. Amid the roaring traffic, tears, laughter and excited chatter surrounded the two long-lost friends’ first embrace since losing touch nearly 60 years ago. “My God, I finally found you,” Cahoon said. The two Air Force servicemen became close friends after meeting on the air base’s track team. Along with Cahoon’s wife, Clara, and daughter, Sharon, they would go to movies and enjoy dinner together. “They never did a darn thing without me being with them,” Salmon said. While it might seem like simple social rituals, it meant the world to Salmon, who is Jamaican, joined the Air Force because he was unable to find work in New York City among racially-biased employers. And the discrimination didn’t stop while in the service. When going to the movies with the Cahoons, a white family, Salmon said it was clear certain people didn’t approve. But for the Cahoons, they loved Salmon for who he was. “But Roy, you never told me you were black,” Cahoon said laughing during the interstate-side reunion. Salmon could hardly find the words to express how much it meant to him to have the friendship of the family that didn’t see him for the color of his skin, but for the quality of his character. “These folks, I was a human being, and they treated me like I was.” Salmon said trailing off. “Family,” Roy said, finishing his friend’s thought. Both men came from poverty-stricken backgrounds, and felt kindred to one another because of it. “I caught all the trouble, but we survived,” Cahoon said. Salmon said a strong part of their friendship was how he always admired Cahoon’s ability to pick himself up and make the most of his life. In addition to what they shared from their backgrounds and similar personalities, Cahoon said there’s a special bond between service members in the U.S. military. Salmon agreed his life and relationships would not have been the same without his military service. For Cahoon, reconnecting with his friend last Friday was one of the best moments of his life. It was a friendship that couldn’t be kept apart coming full circle, Salmon said. And though they might never see each other again, he said he wasn’t worried.